Where is your over abundance? What is your overflowing collection? How do you cram 5 lb. of "stuff" into a 2 lb. sack? 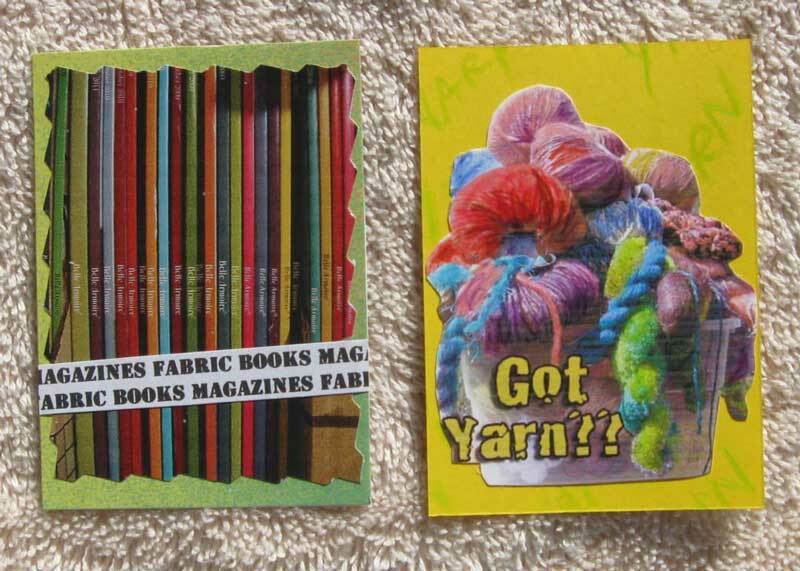 In the September ATC (Artist Trading Card) Swap with the theme "Only so much will fit," artists showed how they pile it, squeeze it and stuff it into baskets, bins, spaces and stashes. Left: "Only so much will fit in my basket." Right: "Only so much will fit... on a 2.5 x 3.5 card"
One of the new traders writes this about her card (below left): "Only so much (news, forest and the tree itself) will fit on a 2.5 x 3.5 inch card. 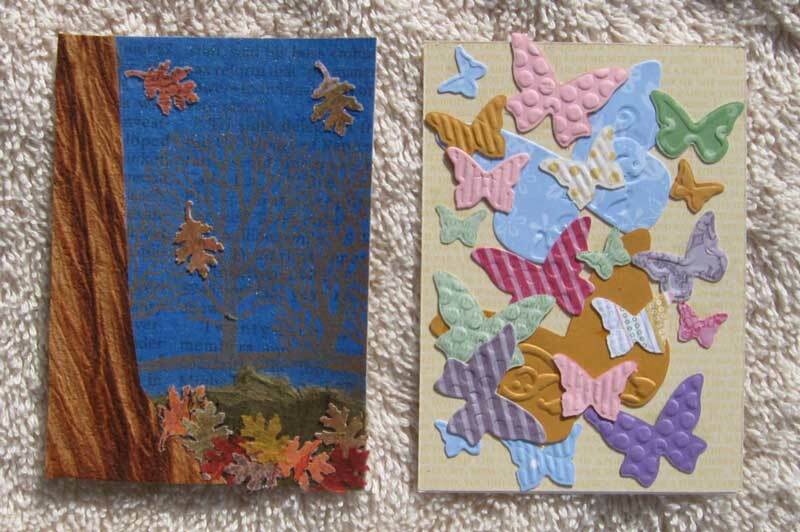 Acrylic paint covers newsprint followed by a Tsukineko inked forest stamp. A commercial handmade paper—Lokta—is the tree trunk and grass. The tiny leaves are punched from leftover scraps of papers batik dyed in a class [at John C. Campbell Folk School], resulting in unique colors on each leaf. Like many things in life, this card is best viewed in a sunbeam because there—it sparkles!" Left: "Only so much will fit"
Right: "Can only hold so much"
Left: "How much will fit?" 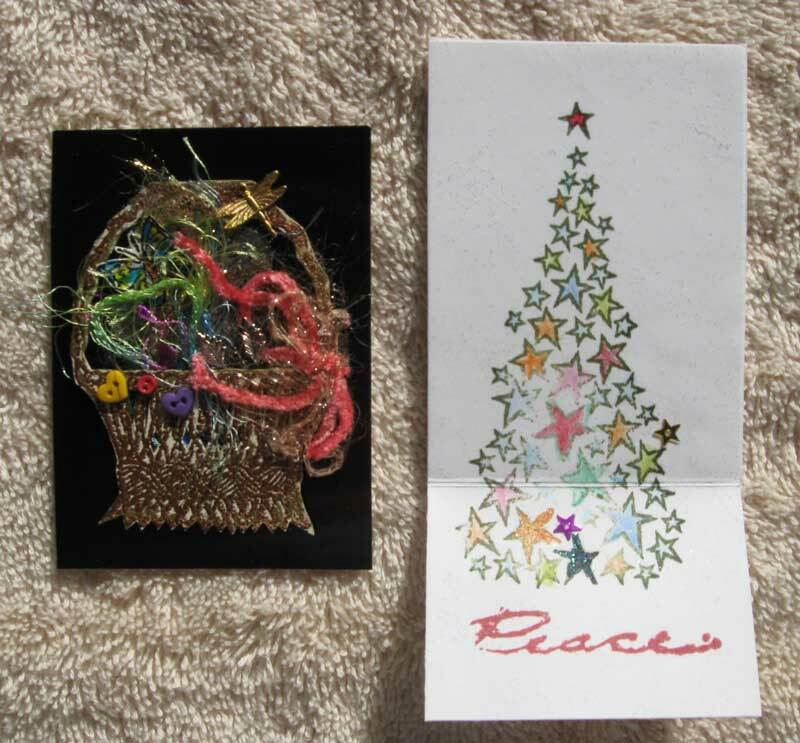 One of the ATC artists is a prolific scrapbooker and greeting card artist. 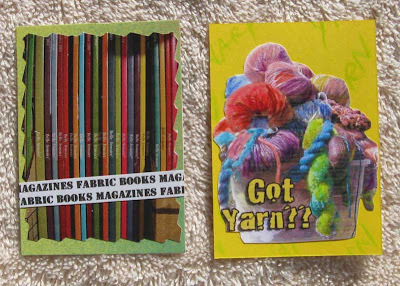 I periodically get one of her lovely creations (and a cheery note inside) accompanying her ATCs. Thanks, Lisa! Your cards are great. 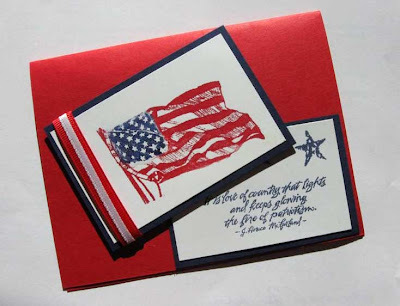 A patriotic note card made by Lisa.